Sen. Bernie Sanders in Davenport, Iowa, last month. Donald Trump in Burlington, Iowa, last month. At 9:30 a.m. on a recent Wednesday, Cyndi Diercks stood poolside at the Paddling Pooch in Bettendorf, Iowa, watching Ollie, her 12-year-old Weimaraner, swim laps. Between tosses of a fluorescent-green floating chew toy, Diercks, the 54-year-old owner of a local landscaping business and a leader of a local tea party group, enumerated all that was wrong with the U.S. economy. The Federal Reserve is devaluing the dollar, Diercks said. Too many Americans are on food stamps or other benefits. Government regulation is stifling small businesses (she bore particular animus toward the Occupational Safety and Health Administration, the federal workplace safety regulator). Inflation is too high. Taxes are too high. Government spending is too high. Statistics showing improvement in the economy are misleading if not outright lies. Such anti-establishment fervor is hardly uncommon in a campaign that has so far been notable for the success of candidates from outside the political mainstream, especially on the Republican side. Yet Diercks seems in many ways an unlikely messenger for that view. She isn’t a disaffected millennial trying to pay off student loans, or a laid-off factory worker facing the decline of the American manufacturing sector, or a retiree worrying about the long-term viability of Social Security. Many in Iowa feel the same way. In a recent Loras College poll, 40.8 percent of Iowa Republicans said the state of the economy is poor, and 29.8 percent said they expect it to be even worse a year from now. Just 13.8 percent believe it will be better. Democrats are more positive, but only up to a point. Just 10.8 percent say the economy is poor, but less than half say it is “good” or “excellent.” And nontraditional candidates like Trump, Sanders and retired neurosurgeon Ben Carson perform just as well in polls in Iowa as they do nationally. But there is a key difference between Iowa and the rest of the country. The state’s unemployment rate, at 3.6 percent in September, is the lowest it has been in close to a decade, and household income has experienced a strong rebound. 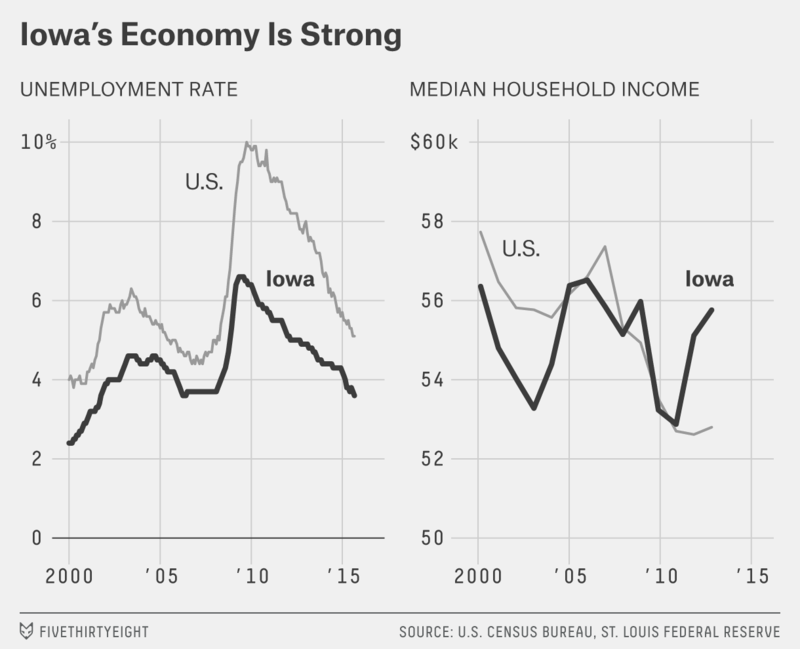 The Iowa economy isn’t “solid but not spectacular” or “surprisingly resilient” or any of the other carefully hedged euphemisms that journalists routinely apply to the national picture. The Iowa economy is strong. In four days of conversations in and around Davenport, Iowa, I heard much of the same economic unease and political frustration that has dominated the national campaign, but filtered through a slightly different lens. Relatively few people had immediate financial problems, although some said they knew people who did. But many had concerns about longer-run pressures — student debt, inadequate retirement savings — and even more expressed deeper, existential worries about the future of the American dream. The recession, which was comparatively mild in Iowa, didn’t cause those issues, but it did lay them bare. I chose to visit Davenport because its economy, its demographics and its politics are representative of the rest of Iowa,1 which will hold its first-in-the-nation presidential caucuses on Feb. 1. Scott County, of which Davenport is the county seat and largest city, had an unemployment rate of 4.3 percent in September, a bit worse than the state mark; its median household income, at about $53,000, is about the same. Scott County, like Iowa as a whole, twice backed Obama for president and then narrowly voted for Joni Ernst, a conservative Republican, for Senate in 2014. Ask about the economy in Davenport and almost everyone immediately refers back to the 1980s, when crop prices collapsed and brought the local economy down with them. Compared to that experience, Davenport’s economy emerged from the most recent recession relatively unscathed. Agriculture thrived during the downturn because of high crop prices, and the Quad Cities also benefited from a strong agricultural manufacturing sector, led by Moline-based John Deere. Scott County’s unemployment rate never topped 8 percent — it hit 10 percent nationally — and it fell quickly once the national economy began to recover. Local leaders brag that they were able to complete the restoration of a historical downtown hotel during a period in which most such projects stalled because of a lack of financing. “At the height of the economic calamity, we actually built our biggest asset,” said Kyle Carter, executive director of the Downtown Davenport Partnership, a local business group. The project helped spark an ongoing revival of the city’s small but architecturally elegant downtown, which today includes such hipster staples as a craft brewery, an artisanal coffee shop and a bar featuring vintage arcade games. Still, Davenport is not immune to the forces affecting the rest of the country. The Rock Island Arsenal, a military installation that is a major employer in the region, lost jobs because of the federal budget cuts known as the sequester, and local officials worry about losing it in a future round of base closures. The agricultural sector has slowed a bit recently, and John Deere recently announced layoffs. The downtown revival remains far from complete, and Davenport’s manufacturing sector has yet to regain all the jobs lost in the recession, let alone those lost in earlier decades. Travis Shepherd, a 33-year-old social studies teacher in the Davenport school system, is not so much pessimistic as uncertain: He is financially stable now but uneasy about the future. Shepherd had gotten married the Saturday before I met him; he had attended a Bernie Sanders rally for his bachelor party. His wife is also a public school teacher, and they were nervously watching the district’s latest round of budget cuts, the result of an ongoing battle with the state over school funding. The school board had just voted to shutter a local school. Shepherd’s job is safe for now. But he said he worried about his family having all its financial eggs in one basket, about whether his investment in his education will pay off, and about whether his pension — what he called one of the few remaining perks of a government job — would still be there when it was time to retire. Some sectors are changing especially rapidly, a process that can be painful for those caught in the transition. The Blong Technology Center, a branch of the local community college system, is dedicated to training students for careers in manufacturing. The manufacturing jobs available today little resemble the factory jobs of a generation ago; they involve 3-D printing, robotics, logistics management. Few require a bachelor’s degree, but almost all demand some form of post-secondary education. The center’s graduates are in demand; Dan Martin, the Blong Center’s director, said employers often call the school looking for recent graduates to hire. But for those who are further along in their careers, or whose skills are less up to date, there are fewer opportunities. At a job fair held at the Blong Center, I met Cassandra Osborn, who was shaking her head in frustration. A 33-year-old mother of three, Osborn had more than a decade of experience in CNC machining, exactly the kind of manufacturing skills that politicians and local officials often say the U.S. needs more of. Yet she had been out of work for a year and a half and saw little evidence that her skills were in demand. I was in Davenport just days before a closely contested local election in which the city’s mayor was unseated after eight years in office. The campaign was focused on local issues — a riverfront development project, a new on-shore casino, the controversial firing of the city manager — but Jason Gordon, a city alderman running for re-election, said he had heard voters talk about how the economy had changed. Gordon, who was re-elected, got his start in politics working for U.S. Rep. Jim Leach, a moderate Republican, and is drawn to mainstream presidential candidates, not the insurgents. (Local government races in Davenport are nonpartisan.) But he said he understood voters’ concern about the long-term direction of the economy. The recession may not have hit Davenport hard, Gordon added, but it nonetheless revealed how fragile the economy can be, shattering what was left of the illusion of stability. On my way out of town, I stopped at the Village Inn, a breakfast spot just north of downtown. Schools were out that day, and the restaurant was bustling with children enjoying late-morning pancakes. In a booth off to the side of the main dining room, a man sat alone eating steak and eggs. Paul — he asked me not to use his last name — spent 40 years as a union ironworker until the company he was working for went out of business in 2010. Rather than sit in the union hall and wait for more work, Paul, now 64, decided to retire. Between Social Security and his union pension, Paul said, his finances are stable. But he was less sanguine about the generation behind him; trade deals, he said, had destroyed much of the manufacturing sector, and Washington was doing its best to wipe out unions as well. Paul said that as a devout Christian, he didn’t vote or support a political candidate. But in his distrust of Washington, he sounded like the many Iowans I talked to who were backing anti-establishment candidates. He was doing OK, but that didn’t mean he trusted anyone in Washington to keep the economy on track. I constructed a simple similarity index of Iowa counties. After experimenting with various economic, demographic and other variables, I settled on six equally weighted components. Five came from the American Community Survey’s five-year estimates for the years 2009-2013: median household income, the unemployment rate, median age, the share of the population that is non-Hispanic white, and the share of the adult population with a bachelor’s degree. The sixth was the Republican Party’s share of the vote in the 2014 Senate election. Based on those criteria, Scott County — where Davenport is located — is the most typical county with at least 100,000 residents. Despite the name, there are actually five cities in the Quad Cities area: Davenport and Bettendorf in Iowa and Moline, East Moline and Rock Island in Illinois. There is some disagreement about which four cities make up the foursome implied by the name. When the name first came into use in the 1960s, it referred to Davenport, Moline and East Moline, but Bettendorf has since surpassed East Moline in size. An attempt to rechristen the area the “Quint Cities” in the 1970s never caught on.